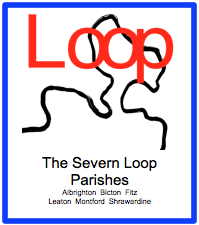 Welcome to the website for the Severn Loop Parishes. We hope that you will find this website useful and informative, whether you are a visitor to the area, a local resident, or a regular churchgoer. We welcome any feedback as to how we can improve your website experience. Each month Gillian Steedman produces a newsletter, which is called 'Loop'.To keep in the loop with what’s happening in your churches you can pick up a copy at church or you can download most recent copies by clicking on the links below. If you have any church-related announcements to go in the next or future editions of Loop, please send them to Gillian before the third Sunday in the month prior to publication month. Her email address is gillian.steedman@gmail.com 01743 850027. Please only contact Gillian regarding items for the Loop. For any other church-related matters, please contact a member of the clergy or the relevant churchwarden here. 10:00am Family Holy Communion at Montford & Easter Egg hunt!